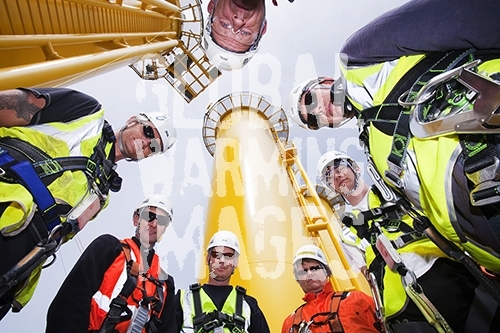 Workers at the Walney Offshore Wind farm, Barrow in Furness, Cumbria, UK, in front of wind turbine transition pieces. The windfarm was constructed and is owned by the Danish, Dong Energy company. It has the capacity to generate 367MW. Converting to a renewable future creates many green, sustainable jobs.